The collaborative will help the grow the next-generation clean energy workforce. USGBC New York Upstate is always inspired by campus partnerships that aim to train students in sustainable and environmentally friendly building design and construction. A great example of this is how two different State University of New York (SUNY) locations are working together. The SUNY Polytechnic Institute, in Utica, has partnered with SUNY College of Environmental Sciences and Forestry, in Syracuse, to deliver new green building courses. The Green Building Experiential Learning Collaborative is supported by a three-year grant of $900,000, part of nearly $6 million awarded to SUNY campuses by Governor Andrew Cuomo to train more workers in the state's clean-energy sector. The LEED Gold Wildcat Field House at SUNY Polytechnic Institute. 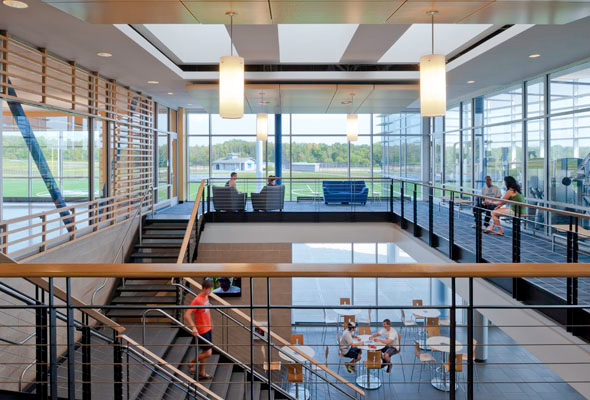 Numerous buildings on each partner campus have been built to LEED standards and will serve as living laboratories, allowing students to see sustainability features in action, such as naturally ventilating automatic windows and renewable solar energy generation. New courses at each partner campus will provide opportunities for students to participate in the certification of campus buildings through course projects. Students looking to pursue LEED credentials will have the opportunity to prepare for and take the exams. The collaborative will help the next generation of engineers, architects, environmental scientists and construction managers be ready to grow the clean energy workforce—an essential strategy as the state prioritizes renewable energy deployment, smart-grid technologies and advanced manufacturing. Students interested in design, engineering, construction and sustainability are the target cohort for these new courses. Additionally, SUNY is working to expand existing cooperative programs in engineering and other disciplines to help students complete their degrees at multiple SUNY schools. The collaborative will also develop a greater in-house capacity of LEED Green Associates, LEED APs and Certified Building Energy Modeling Professionals to help certify new and existing campus buildings across the SUNY system. During the three-year pilot program, best practices will be shared to help expand training system-wide. “We look forward to developing more collaborations around the state and being able to share our experiences with colleagues who are interested in engaging students in real green building certification projects,” said Mark Bremer, Principal Investigator on the project.